I'm on my second pair in the last 20,000km. The old pair didn't wear out, more I just couldn't get rid of the smell from them no matter what I tried. I wear these all day. You will notice performance improvements over your old Scotts - the Shininess Effect is real! My Bontrager shoes are edging closer to replacement. Only 8,000km, but the ratchet straps are looking pretty chopped up and the inner soles have more or less collapsed again, causing me to tighten the shoes every 30 min or so of riding to maintain a tight heel. Damned if I'll buy another $70 set of inners for them. Bont Vaypor will probably be my next shoe - the shoe of choice among most of the guys I ride with. 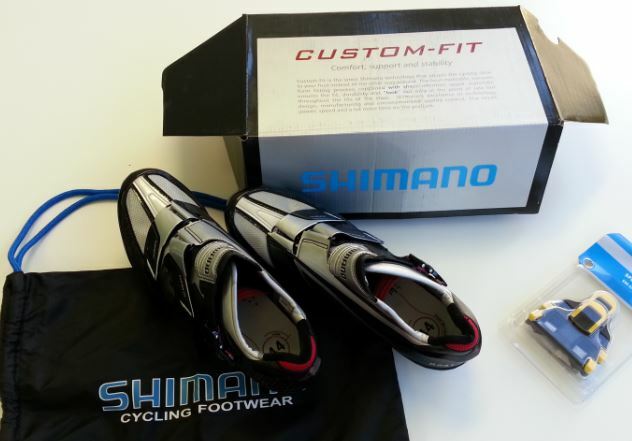 Have had a pair of Shimano SPD shoes with recessed cleats for years, maybe 7, seem indestructible except for padding at the heel cup, which I replaced with a bit of leather. I do wear another similar pair without cleats around the shops etc and locally. The holes in the bottom are good for cooling. @ Rob - You mean you don't have to change shoes when you get to work? that's right John. Now it is getting cooler I don't need to change from shorts to pants either. Ride in, lock bike, work. I have to wear work clothes at work - can't be avoided. Do you keep spare shoes at work if you get rained on? Wet shoes all day would be a bummer! Light weight spare shoes I take on wet days, drying on the way home.